Looking for a fun and adventurous getaway? Definitely look no further than Reykjavik, Iceland. With a five hour direct flight on Iceland Air, it is the perfect trip for a long weekend and is bound to include interesting sights, beautiful terrain, delicious food, and some incredible nature. I just returned from a fantastic trip, and I recommend you all look into heading up north for a few days to enjoy all that Iceland has to offer. Where to eat when you are in Reykjavik? I've got you covered. We arrived in Iceland around 7AM and we were anxious to get to a warm and cozy spot to load up on coffee and comfort food. Our hotel recommended The Laundromat Cafe, located right on the main drag in downtown Reykjavik and we immediately knew it was a perfect choice. The walls are covered with photos of laundromats and world maps. The bar is in the center of the restaurant lined with old books, and the vibe is super laid back with people hunkered down in booths enjoying great food and working on their laptops. We both ordered large sized lattes, and the pancakes. It sounded like a classic choice and just the sort of thing you want to dig into after a long flight. It was everything I had hoped for and more. Five silver dollar sized fluffy pancakes stacked on top of one another with butter and lightly drizzled syrup. In fact, it was so good we went back for our last meal before we left Iceland as well. And we ordered the same thing. The menu is eclectic and offers everything from breakfast foods to nachos to pasta and burgers. Everything that was being served around us looked great. The Laundromat Cafe is located at Austurstræti 9. Before heading to Iceland I surveyed the Twittersphere for the top restaurants to visit. 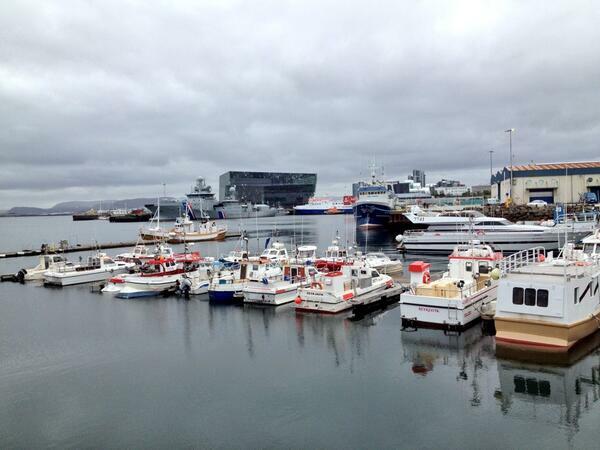 Almost everyone said Fish Market and The Grill Market (these are sister restaurants both in downtown Reykjavik). Fish Market was our first dinner in Reykjavik and we were impressed. Located in a pretty yellow house, the interior transports you to a modern Asian space with an interesting menu filled with sushi, fish, meats, and more. We loved the warm bread served with freshly churned butter to start, and the glacier maki with langoustine, wakame, and orange was a great roll to begin the meal. The fish entrees were excellent and we especially enjoyed the preparation of the Blue ling atop a creamed barley and a peanut sauce. The desserts at Fish Market are also not to be missed. The warm chocolate cake was a perfect end to our first dinner in Iceland. Fish Market is located at Aðalstræti 12. For our last night in Reykjavik we decided to dine at The Grill Market. From the street you would never know that such a gorgeous restaurant is hiding in the back alleyway. The atmosphere was inviting and warm, with upholstered benches and booths that appeared to be made from a warm striped scarf. I loved the chicken wings made with a homemade peanut sauce, and also couldn't help but eye all of the amazing dishes that were being served to the tables around us. The tasting menu is a popular item at The Grill Market, and minke whale is one of the signature dishes. The grilled corn on the cob with butter and black sea salt was a delicious vegetarian side dish done right. Finally, I enjoyed the beef rib eye for my main course served with curly fries, sauteed vegetables, and a mushroom sauce. The Grill Market is located at Laekjargata 2A. This is the only wine bar in Reykjavik, and it is actually tough to order wines by the glass in most restaurants unless you're willing to go with the house offering. Vinbarrin happened to be located on the bottom floor of our hotel which was just perfect. It's a very pretty and sleek space, and was often populated with a mix of locals and those of us visiting. They had a great selection of wines, and they also serve dinner with a menu that changes daily. I highly recommend starting or ending your evening at Vinbarrin with a nice glass of wine. It's a lovely spot, and one not to be missed in Reykjavik. 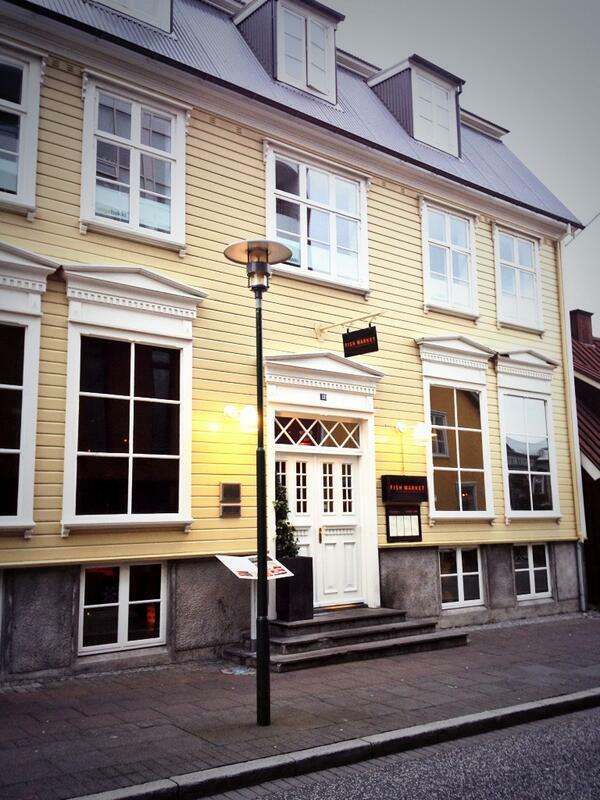 Vinbarrin is located below the Kvosin Downtown Hotel at Kirkjutorg 4. After a long day of excursions outside of the city, we were looking forward to a civilized and high-end dining experience. Borg Restaurant, located at the upscale Hotel Borg is a perfect spot for an enjoyable meal. The restaurant is decorated beautifully, and the menu offers delicious options such as a spring roll appetizer with peanut sauce, and a grilled beef tenderloin over a noodle cake. The restaurant service was nice, and they provided a delicious amuse bouche of ceviche which kicked off a very nice meal. A bit pricier than some of the other spots in town, but it was worth it. Borg Restaurant is located at the Hotel Borg at Póshússtræti 9-11. We were on the hunt for a nice place to grab breakfast/brunch, and our concierge recommended checking out the new French cafe Le Bistro. The interior is just adorable, and was decked with olive oils, wine bottles, pots and pans hanging from the walls, and all sorts of Parisian treasures. The staff was speaking French, so very quickly we realized it was a legit establishment. We started with the delicious bread basket which included warm chocolate and regular croissants, and then moved onto the croque madame and an omelette with ham and cheese. Both were extremely satisfying and hit the spot. The coffee and lattes at Le Bistro definitely stood out as well. Be sure to swing by for a meal when you're in town. Le Bistro is located at Laugavegi 12. In addition to great food, I also highly recommend you stay at the fantastic Kvosin Downtown Hotel. We had an incredible apartment to ourselves which included a modern and comfortable space with a couch, full kitchen, Nespresso machine, and lovely amenities such as free breakfast in the downstairs restaurant Bergsson Mathús. We loved it here. Other places that are worth looking into include the Radisson Blu 1919 and Hotel Borg. For activities and excursions I recommend Reykjavik Excursions or Iceland Excursions. Enjoy the trip!